Sunday morning following the Trump inauguration, NBC´s Chuck Todd questioned statements made by Whitehouse spokesman Sean Spicer concerning proof of the actual size of the turnout for the event. 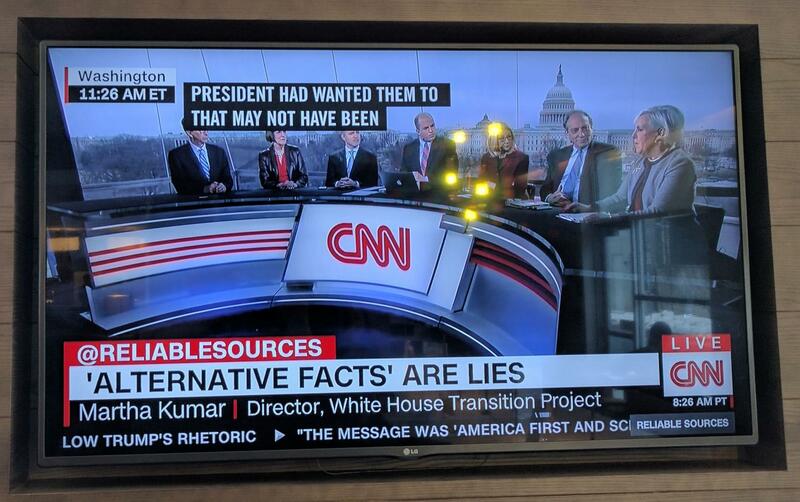 When questioned, Kellyann Conway told Chuck that Sean was only offering "alternative facts", to which Todd replied, "Alternative facts are just falsehoods". Is there such a thing as an "alternative fact"? Is this another way to say "facts which present an alternative view"? A simple ngram search shows this is not a new usage. And I found numerous usages of the phrase. Here is one, in an appropriately titled book. "Alternative facts" is a US legal practice phrase that is over 100 years old. 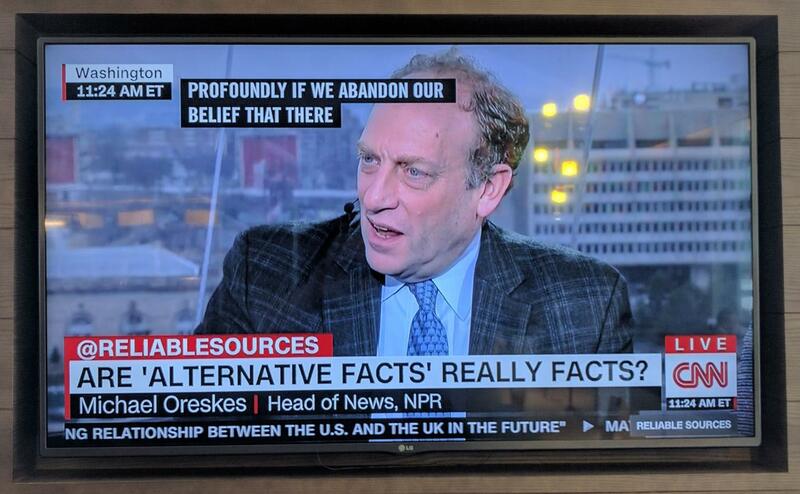 Provided the alternative facts or the alternative interpretation you put is reasonable, an expert who resists such a suggestion looks less credible. You might want to address alternative facts, however, if they allow your opinion to remain the same. The expression “alternative facts” might seem contradictory, but it simply means competing facts. In a civil case, if there weren't alternative possible facts, the case wouldn't be at trial; it would have been decided at summary judgment. The proof will be in the experts' ability and willingness to handle alternative facts in their own theories or to apply alternative methods than the ones upon which they rely. There is no effort in this pleading to allege alternative facts. So "alterative facts" is a competing version of what the events actually were, based upon evidence availible. In physical sciences, an alternate fact is a true statement that, while appearing to contradict another fact, actually illuminates the subject to greater depth. For example, is light a particle or a wave? Bertrand Russell in his introduction to the Tractatus Logico-Philosophicus says that facts are what make propositions true. Suppose we have a fact A and that the proposition "A is true" is true and we have an alternative fact B and "B is true" is also true. In itself this is not a problem and so there can be alternative facts. For example if A is "I own a cat" and B is "I own a dog". However if A and B contradict each other then any reader of Aristotle or George Boole or even Ayd Rand would tell you that both A and B cannot be true. So, yes there are alternative facts but there are none that contradict other facts. If you own both a cat and a dog then yes, both A and B can be true- simultaneously. Her "facts" appear while looking looking at something with a limited, incomplete, or different worldview. It's an incomplete thought, and can be used to manipulate less motivated people. It's also likely to be a logical fallacy. Let’s look at what the freely available online Oxford Dictionaries say. 1.2 (usually facts) A piece of information used as evidence or as part of a report or news article. Does “pieces of information used as evidence or as part of a report or news article, that are available as another possibility” make sense in the context of the Kellyann Conway statement? I think it does! Both of these words have other definitions. If you do an Ngram search, some of the examples you find may be similar in meaning to Kellyann Conway’s intended meaning, and some may be different. You have to look in the context of each case to determine what the phrase means. Maybe in a more philosophical context, like your second quote, it could even mean something apparently contradictory like “alternative truths about events”. She was naively putting up a weak excuse for "lying". She was calling it a false statement that (for whatever reason) the administration wanted, or wanted the public, to assume was true. So that, as far as I can see, rules out most existing answers (certainly the highest-voted ones). I'm not saying those answers are wrong; I just think that other answers are possible if we optimistically assume good faith from Conway. Both sides were starting from different facts and drawing very different conclusions. In this interpretation, Conway was conceding that the media had started from factual information, but she believed that their information was leading them to incorrect conclusions. She meant that Spicer's facts were equally correct, but that his conclusion was better. 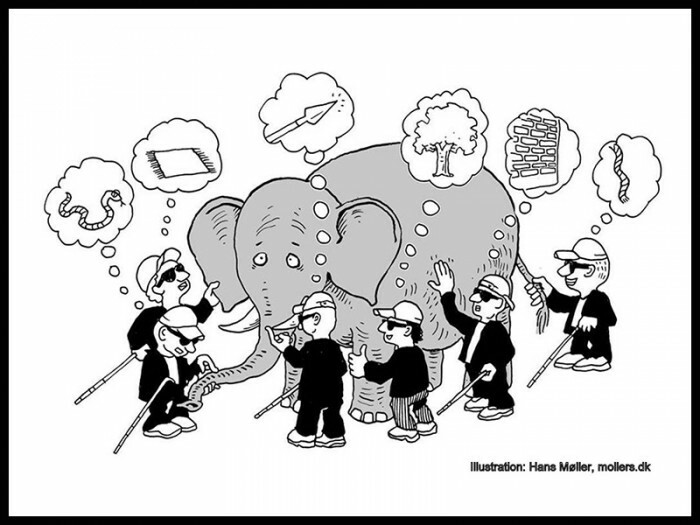 The classic parable of the blind men and the elephant, which LamonteCristo's answer contains an illustration of, is about exactly this phenomenon. All starting from equally correct facts, all coming to plausible conclusions that can't all be correct (though in the parable, they're all wrong). I realise that this is largely speculation on my part. However, I believe this still constitutes a satisfactory answer to the question: "What could 'alternative facts' mean in English?" It can mean facts not yet considered, or not given much weight, which change the conclusions people are likely to come to. Edit: I would appreciate feedback from those who are downvoting this answer. I'm not trying to take Conway's side by giving this answer; I'm talking language, not politics. Whether she was telling the truth or not is not directly related to the meaning her words had. To put it another way: If I say "the sky is red", I mean "the light reaching our eyes from the atmosphere overhead causes a response in the eye similar to that of light of approx. 700nm wavelength". Knowing that I'm wrong doesn't change the denotation of what I said. And whether Spicer's "facts" were true or not doesn't make my suggestion, that Conway was claiming they were factual, any less plausible. Edit 2: Of course, now that Spicer is on the record as saying "sometimes we can disagree with the facts", my inference is even less likely to be what was meant. I stand by it as an answer regarding English usage, but in context it doesn't match with the evidence. So, finally we get a Wiktionary entry. The term was used by Kellyanne Conway in January 2017 and widely repeated in the US media. The meaning that the term has taken on is not necessarily the meaning that Conway intended. The term is used in the legal profession. For example, in 1991 an opinion of the U.S. Supreme Court contained this: "If the presumed fact is not itself necessary for the verdict, but only one of a variety of facts sufficient to prove a necessary element, the reviewing court should identify not only the evidence considered for the fact subject to the presumption, but also the evidence for alternative facts sufficient to prove the element." A textbook used in legal education states: "The expression 'alternative facts' might seem contradictory, but it simply means competing facts. In a civil case, if there weren't alternative possible facts, the case wouldn't be at trial...." This phrase is an example of legalese ("Wording that resembles how a lawyer writes, especially such that is confusing to the layperson.") This phrase is also an example of a term of art. (law) Use in plural form, sets of inconsistent facts, each of which has evidence to support those facts. Those inconsistent sets of facts could also be presented by the same party. Alternative facts would seem to occupy the same grey area as Doublethink. Doublethink is the power of holding two contradictory beliefs in one's mind simultaneously, and accepting both of them ... To tell deliberate lies while genuinely believing in them, to forget any fact that has become inconvenient, and then, when it becomes necessary again, to draw it back from oblivion for just as long as it is needed, to deny the existence of objective reality and all the while to take account of the reality which one denies – all this is indispensably necessary. Even in using the word doublethink it is necessary to exercise doublethink. For by using the word one admits that one is tampering with reality; by a fresh act of doublethink one erases this knowledge; and so on indefinitely, with the lie always one leap ahead of the truth. Revisiting this question I noticed that the definition for alternative in Merriam-Webster's online dictionary leads us directly to the semantics and give a clear idea why they are problematic. As is so often the case with natural language, Ms. Conway probably used the term in a blurry mix of both meanings: Sean Spicer wanted to offer a choice of facts; he offered a different story in addition to an existing one, giving his listeners a choice between them. And indeed, the story he added was outside the "usual or conventional", as is the whole administration; "existing or functioning outside the established cultural, social, or economic system" seems like written to describe it. This is actually the reason Trump was elected: Because (almost) a majority of voters are tired of the usual and conventional — culturally, socially and economically, especially in Washington. But the semantic trouble is openly visible: What Spicer offers are not, as Al Maki discusses, facts to choose on top and beyond established facts — no, Spicer offered a choice of facts which contradicted the established truth; it is an "exclusive or". He is not an alternative movie theater playing independent movies, in addition to the existing multiplexes. No, he shows a color version of Casablanca with golf courses in Manhattan's Central Park and Brad Pitt as Rick sitting in a golden Diner with a happy end, and claims that that is the real Casablanca, or at the very least equally valid. There are a lot of people liking it, even though it got terrible reviews in the New York Times. You can say of it then either that 'it is useful because it is true' or that 'it is true because it is useful.' Both these phrases mean exactly the same thing [...]. The bottom line is that reality will deliver a feedback to our beliefs, earlier or later. The expression "alternative fact" was a clumsy reference to Spicer's complete statement. He said that Trump had attracted “the largest audience ever to witness an inauguration” in person and in the world. That is, you can estimate the size of the crowd in DC only -- or alternately, you can estimate the world-wide audience. The alternative to "fact" is "falsehood". If Sean Spicer was presenting true statements, facts, which presented an alternative view, then your interpretation would be correct. Since Sean Spicer was presenting false statements - not just a difference of opinion but provably, factually wrong based on evidence - then this is not the case. Not the answer you're looking for? Browse other questions tagged phrases expressions neologisms or ask your own question. Can “the fact that X” imply “X is a fact”?